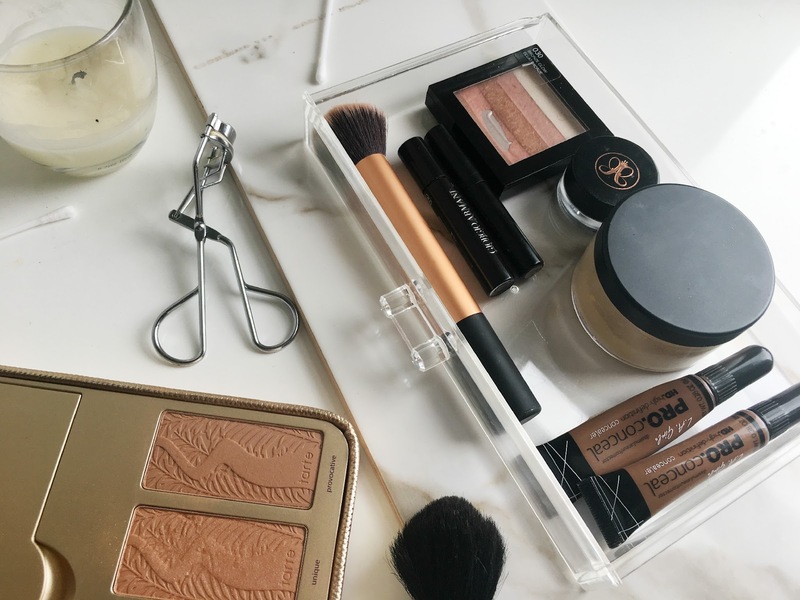 A 5-minute makeup look is sometimes the only makeup look I have time for when it comes to rushing there are times I don't even wear makeup but if I want to look a bit better then I will make a little bit of an effort. On days like this, I always stick to the same look each time. No matter how rushed I am, I always have to make time for my skincare which is very important to me. I'll spend around 5 minutes before hand ensuring that my face is nourished and hydrated. I never use foundation when I am trying to rush somewhere as I find it takes so long to do especially as I like to take time setting it in with my beauty blender. So I go straight to the concealer, I use my trusty LA Girl Pro Girl Concealer to conceal my under eyes, around my nose and below my chin. It provides high coverage to conceal those dark under eye circles and any blemishes around my face. No matter how quick I'm trying to rush, I always have to set my under eyes with a bit of loose powder, so I use the Sacha Buttercup Powder in Banana to do so. Or else, that little bit of concealer will move around my face. My eyebrows are a necessity in my everyday makeup routine, so I'll spend 2 minutes of this 5 minutes to fill in my eyebrows with my Anastasia Beverly Hills Promade and clean up underneath my eyebrows. As I previously spoke about in my How I Fill In My Eyebrows post, this promade is amazing and lasts all day. After this, I find that I look really weird without doing anything around my eyes so I like to coat my eyelashes with some mascara. Usually, I use the Giorgio Armani Eyes To Kill mascara to provide a full look. Somehow I always find time to put highlighter on the high points of my face, like my cheekbones, nose and lips! To do so, I end up mixing some of the highlighters from my Tarte Pretty Paintbox and Revlon Highlighting Palette in Bronze Glow. To finish it off, I put on a lip balm and I'm out the door! What is your 5-minute makeup look?